I picked this book up on my honeymoon while browsing a book store. This wine guide caught my eye because Chardonnay is my go-to grape. As the writer notes in her introduction, I am the girl that stares at the wine list at a restaurant, and if nothing catches my eye (or I don't know what the heck I'm looking at), I'll "just have the Chardonnay". 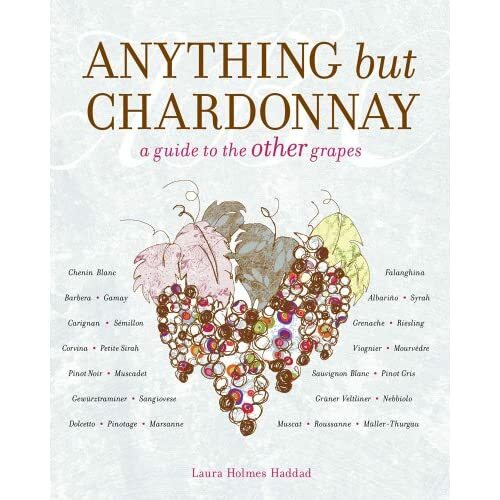 Now, Chardonnay lovers, this book does not knock this palpable wine that pairs well with many foods... but it does point out the monotany of not exploring the many other delicious grapes and discovering what they have to offer. This book is written in a casual voice, is very easy to read, and is not at all "snobbish" like many other wine guides. Since reading this, I have opened up my wine rack to many new and interesting wines and been truly pleased with where it has taken me! This book now resides in an easily accessible place in my kitchen so I can quickly skim the pages for the perfect pairing to my meals.